Tour De France – Grand Depart – Stage Two passes our front door! 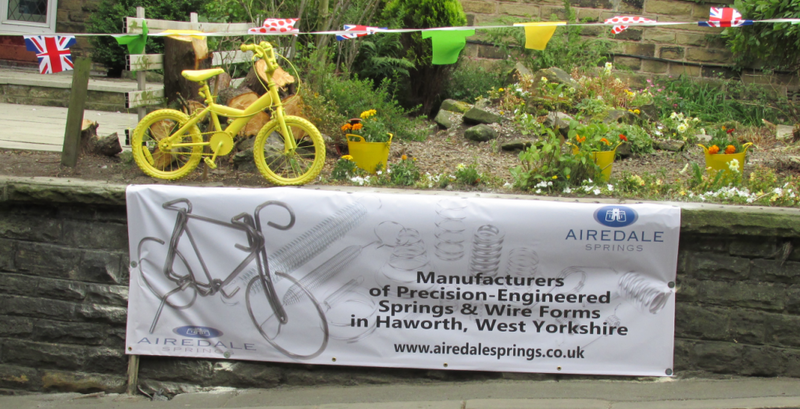 Airedale Springs supplies springs and wire forms to many well-known bicycle manufactures and the Tour was an ideal opportunity to demonstrate to the community what we do. 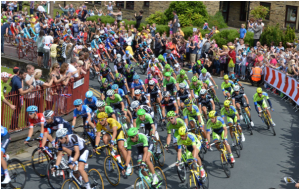 Yorkshire was privileged this year to host “The Tour de France – Grand Depart”. The two stages from Leeds to Harrogate via the Yorkshire Dales and York to Sheffield via the Pennines were a great advert for Yorkshire showing the beauty of our region to the world. On Sunday 6th July after much preparation and anticipation the race passed through the village of Haworth and up the famous cobbled main street. The weather was glorious, the crowds huge and the atmosphere fantastic. It was the longest street party the area has ever seen. (With thanks to our employee Kath Rutter and family for allowing us to use their garden wall). The Peloton rounds the corner into Bridgehouse Lane opposite the entrance to Airedale Springs. 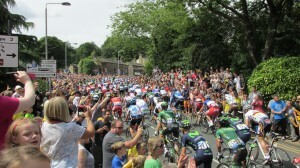 The Peloton approaches the bottom of the famous cobbled main street from Bridgehouse Lane amid the mass of spectators. Here at Airedale Springs, we pride ourselves on the quality of our service and products, the dedication of our staff and our commitment to the environment. Whether our customers are looking for a small batch of handmade, bespoke springs or a bulk order of compression, tension, torsion springs and wire forms, we consistently enjoy the satisfaction of knowing that we’re providing the best service we possibly can. However, every now and again we also get to enjoy recognition for our individual achievements inside and outside work..
For more information on our services, or to discuss your requirements for springs, wire forms or pressings, please call us on 01535 643456 or use the form on our contact page or our web site.